Jump Power is a rather unknown producer of trampolines and we were quite taken aback by what we’ve seen. This kind of trampolines is slowly dying out due to how impractical they are – even if they are quite safer and more stable than the rest. 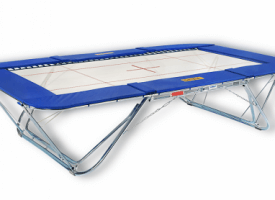 The trampoline market does lack good in-ground trampolines, and there’s not much choice, so whatever there is, is guaranteed to hit good sales figures. 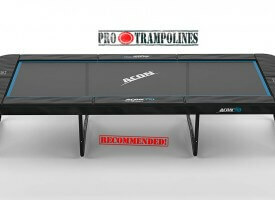 But this is a capable trampoline that we don’t hesitate to recommend, if you’re ready for some diggin’! The first thing than comes to mind when you see it is obvious – where are the legs? Well, of course, there aren’t any visible, since the trampoline is in-ground. This means it’s also lower and supposedly more secure. Curved poles look futuristic and a sleek orange stripe looks very flattering. The design is supposedly made in Italy (mmmkay). 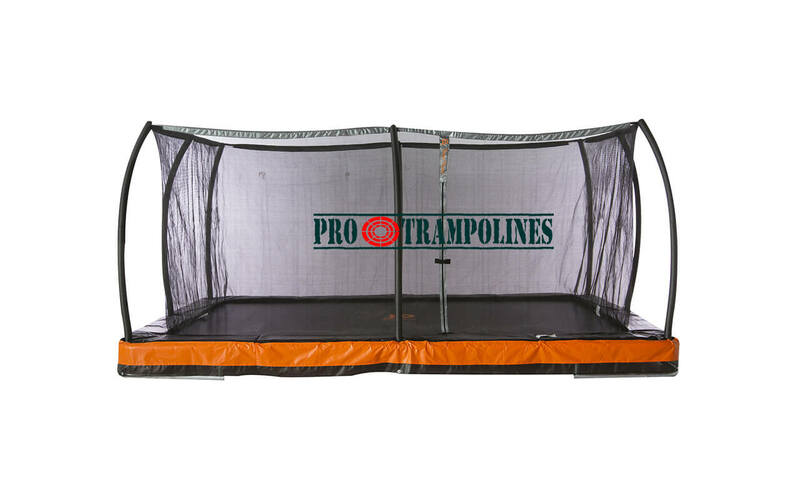 The in-ground design actually makes the trampoline look smaller than it is, mainly due to reduced height. Not that the trampoline itself is large, though. A nice-looking trampoline, overall. The steel frame is very sturdy and generally reliable. 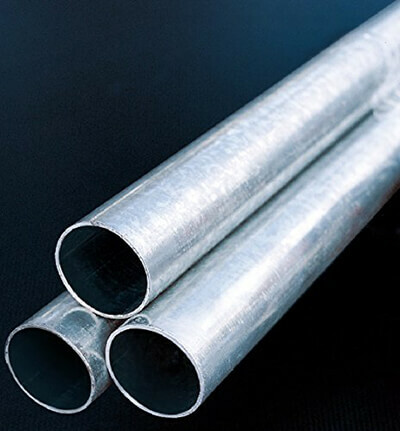 The tubes are 16 gauge steel x 1.75” in diameter. 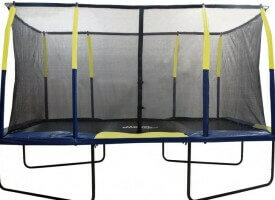 A little smaller than on Acon Air rectangular trampoline, for example, with its 2.4 inch-wide tubes. Of note are the great enclosure poles that are curved and covered in a thick layer of black foam. Hitting these poles is all but impossible. The overall weight limit is 220 lbs, a bit on the low side, but still enough for most use cases. The frame is tested to 4 million bounces. There are no welds, which, according to the manufacturer, makes it a ‘green trampoline’. To you, it makes a difference in that trampolines with T-joints instead of welds are usually easier to set up. The enclosure netting is adequate, but it could be more taut. The net attaches to the frame via a very heavy-duty cable. Fortunately, it is covered in a plastic material. 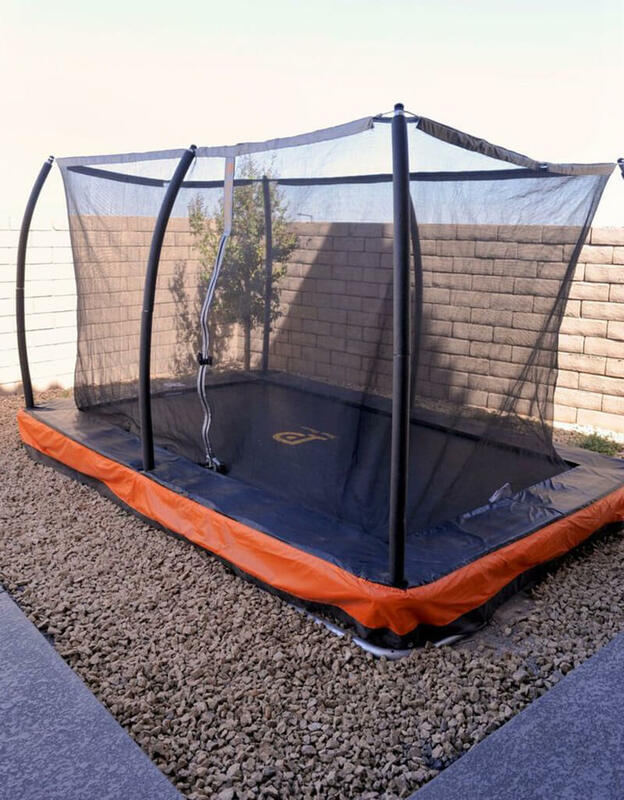 There is a zipper that you use to get in and out of the trampoline. Getting in and out is a breeze, as the trampoline is at the ground level. This is particularly important for kids, who might find it difficult to climb regular trampolines. The vinyl safety pad is impressively thick and substantial with a whole inch of spongy material. Additionally, the enclosure attaches to the mat so the safety is further enhanced. The pads and the netting are UV resistant. The mat is certainly above average. The polypropylene TenCate Permatron mat does its job fine. Reportedly, it doesn’t stretch and lasts for longer, even in perilous weather conditions. The fabric is finely woven – we’re convinced. 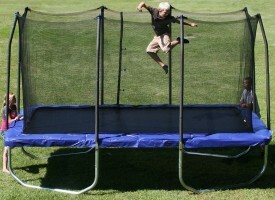 Being a rectangular trampoline, the bounce is freer and more natural than with round trampolines. Also, since there are no legs but the trampoline stands firmly on the ground. Therefore there are no forces twisting the trampoline and wasting the energy that should have gone to make you bounce higher. However, bounce can be compromised if there is insufficient airflow in the hole. You can recognize whether that’s the case if the mat becomes very stiff and hard to bounce on. Make sure to ensure airflow by installing flexible piping from a few feet from the trampoline to the hole below it. Setting it up by leaving some distance between the trampoline and the hole wall is dangerous. There is a below-average number of springs, but they are quite long so it evens out. Overall, you get 58 springs that are 6.5” long. Those springs shouldn’t rust – although that’s just a pinky promise from the manufacturer. The warranty is 5 years on the frame and 180 days on all other parts – more than some other high-profile manufacturers offer. The manufacturer can be reached via Facebook, along with the official channels listed in the instructions leaflet. This is where things get interesting. While an in-ground trampoline is nice, digging a 3-foot deep hole most decidedly isn’t. Now if you’ve dug a hole for some reason (gold mining? We don’t judge) it could fit with minimal adjustment. The hole can be bowl-shaped, but it should be deepest at the center. However, if you don’t have a hole handy, think long and hard about whether you’re ready to commit – if you decide to move the trampoline, you’re still left with a huge hole in your yard! 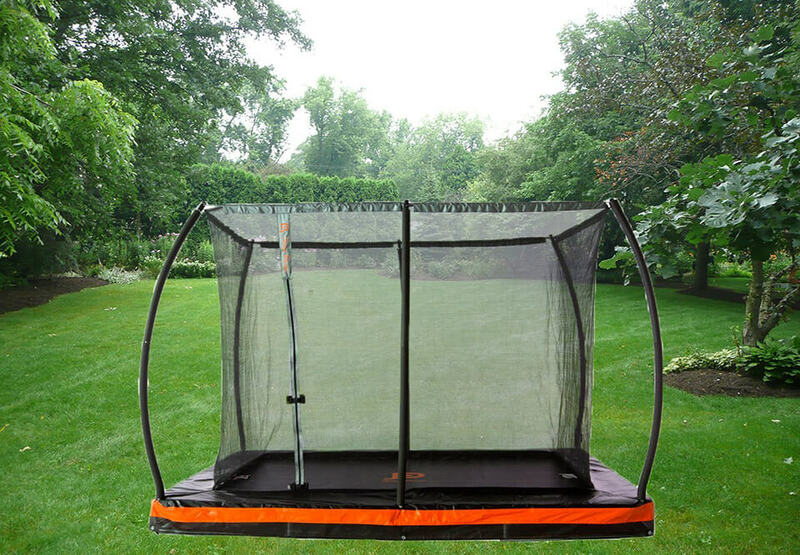 The trampoline itself can be assembled within 90 minutes and the process is not much different compared to regular trampolines. Now, what to make of this trampoline? It’s a solid piece of equipment, but there’s a reason why in-ground trampolines aren’t that popular. They require plenty of preparation and not many people have time for that. At least installation is painless. 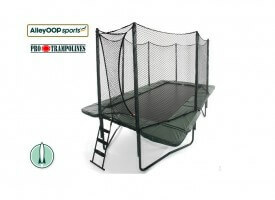 Taking that into consideration, it’s a fine mid-range trampoline with an interesting design and a very adequate price. It does have some of that high-end flair with its design and quality mat. It is quite small, though – but there’s no room to nitpick. 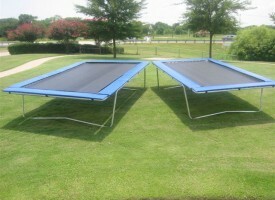 In-ground trampolines are rare, and rectangular ones even more so. If you’re set on buying one, you might as well settle on this baby. 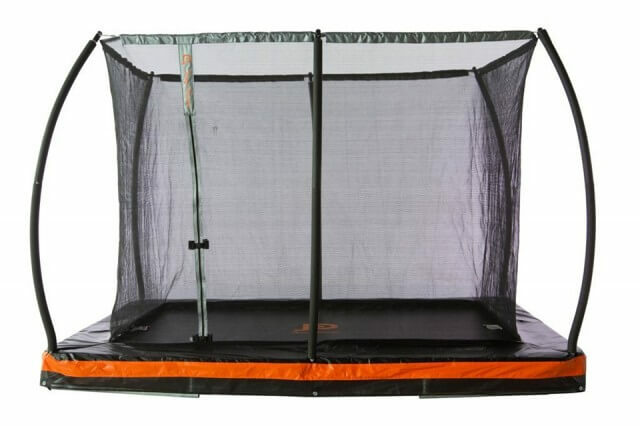 Maybe it is not best trampoline in the world, but affordable price really makes a trampoline worth to buy. If you plan to dug a hole, of course.